“I don’t want to go to school!” Who hasn’t heard that phrase before? While we may chuckle remembering the lengths we might have taken to avoid school, there are many children and adolescents whose struggles with school are much deeper and demand more urgent attention. They are exhibiting school refusal behavior, and their actions signal that something is very wrong. School refusal behavior is often associated with co-morbid disorders such as anxiety or depression and has far-reaching and long-term consequences. School refusersmay have serious problems with nightmares, temper outbursts, poor academic performance, stunted social skill development, and even physical ailments. In this unique slant on an often-misunderstood phenomenon, Dr. George Haarman will show you how to simultaneously address two competing demands when treating school refusal- immediately meeting attendance expectations set by the schools while also digging deeperto uncover and treat underlying problems. You will be able to more quickly differentiate school refusal from common phobic reactions by recognizing and addressing the presence of anxiety, depressive, and other disorders that may be co-morbid or causing school refusal. 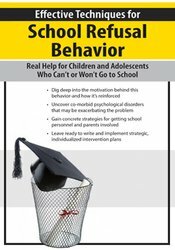 Armed with a better understanding of the particular motivation and reinforcement systems related to the school refusal behavior, you can then offer strategic, individualized intervention plans that have a much greater chance of success. Recognize the behavioral and clinical features of school refusers to better inform clinical decision making. Analyze the functional purpose of school refusal behavior to determine appropriate treatment strategies. Identify co-morbid psychological disorders associated with school refusal to improve treatment outcomes. Evaluate individual, family, behavioral, and pharmacological approaches to the treatment of school refusers. Design strategic school refusal plans that target the underlying motivation and reinforcement systems. Explain to parents and school personnel how to incorporate numerous tips designed to remedy school refusal behavior. George B. Haarman, Psy.D., LMFT, is a licensed Clinical Psychologist and a Licensed Marriage and Family Therapist with over 30 years of experience. A member of the American Psychological Association and Kentucky Psychological Association, Dr. Haarman is in private practice in Louisville, Kentucky and serves as a consultant to several school systems regarding the assessment of children. For 24 years, Dr. Haarman worked in the Department of Human Services in Louisville, serving as the deputy director for the last 12 years of his tenure there. His prior experience with DHS included working with youth detention centers, juvenile group homes, child protective services, and juvenile probation. Dr. Haarman received his doctorate in clinical psychology from Spalding University and has been an instructor at Jefferson Community College, Bellarmine University, and Spalding University. He has presented seminars regionally and nationally on psychopathology, depression, and emotional disorders in children and adolescents. He is also the author of three books: School Refusal: Children Who Can’t or Won’t Go to School, Mastering DSM-5®, and Clinical Supervision: Legal, Ethical, and Risk Management Issues. Financial: George Haarman is in private practice. He receives a speaking honorarium from PESI, Inc. Non-financial: George Haarman is a member of the American Psychological Association; and the Kentucky Psychological Association. PESI, Inc. is an AOTA Approved Provider of continuing education. Provider #: 3322. This self-study course qualifies for 6.0 self-study contact hours or .6 CEUs in the Category of Domain of OT and Occupational Therapy Process. The assignment of AOTA CEUs does not imply endorsement of specific course content, products, or clinical procedures by AOTA. Course Level: Intermediate. Expires: 12/14/2020. PESI, Inc. designates this self-study activity for a maximum of 6.0 AMA PRA Category 1 Credit(s)™. This activity was originally recorded on 12/14/2018. It was last reviewed on 09/06/2018 and is valid until 09/06/2021. This course is offered for .55 ASHA CEUs (Intermediate level, Professional area). **ASHA CEUs are available on this course from 02/01/2019 to 01/31/2024. PESI, Inc. will submit ASHA CEU Requests to the ASHA CE Registry on a monthly basis; ASHA CEU Requests received before 02/01/2019 or after 01/31/2024 cannot be reported.